Perhaps I could cleverly reply, “I don’t have a church – it’s God’s church,” and do so with some biblical warrant (see 1 Corinthians 3:9). But since they’re typically not asking for a lesson in fundamental ecclesiology, I feel like I should give them a serious answer to their question. But it’s not always as easy to answer as it might seem. The common response might be to tell people that the church is doing well because a number of people are coming and new people and families are continuing to visit and stay. But there are places called “church” with tens of thousands of people who are not doing well at all in God’s sight, because they are not acting in faithfulness to God’s word. So mere numbers are no indicator at all of how a church is actually doing. But when you know that numbers are no necessary indicator of doing well in God’s sight, what do you say? How do you know if a church is doing well? Is it measurable? On the surface, our church looks mostly as it did the first month after we started. We meet in the same place; a few more people are showing up each month; nothing all-that-observable or extremely significant has changed in appearance. I don’t know the nitty-gritty personal details of everyone’s life and how faithfully they are walking before the Lord in their day-to-day life, though I try to take a great interest in this and find out as best I can how I might help people to do this. But is the church doing well? What does it mean for a church to do well? People continuing to believe the gospel without being drawn away from it is a sign that a church is doing well. In some ways, the most important thing that is happening is that nothing is changing at all on this front. When people are receiving the word of God as the word of God, this is a reason for great thanksgiving before God, as it is an indicator of their true salvation. When people are doing the work of the ministry – speaking the word of God in love and truth to one another, serving one another for the other’s good – then the body of Christ is being built up. Growth happens as the body works to help itself grow, by the power of God as he works through his word. Growth in the knowledge of Christ leads to growth in godly living. A church will grow, and is growing, when its people are growing in the knowledge of Christ, as they grow in their understanding of the truth of Scripture and apply that truth through wise and godly living. A church that is “doing well” has a good reputation as godly and upright people in the sight of the world, even if others will not join with them due to rejecting the gospel and its demands. The word of God will be going forth from it so that people are hearing the truth of God, and they will look at the church as a faithful representative of the character and glory of Christ. I believe that many of these things are going on at Crossway Bible Church, and for that I am deeply thankful. We have a wonderful group of people who are eager to learn from, grow in, and stand firm by the word of God; to serve one another; and to testify to others, both in their words and in their conduct, of the truth of Jesus Christ. At the end our recently-completed two-year men’s training course at Grace Community Church, one of the guys asked if I could send them some recommendations for podcasts and other audio to listen to and continue to grow in their knowledge of the Scriptures. This one is currently at the top of my list to listen to. This a a two-year cycle of men’s leadership and ministry lessons and they are just absolute gold. I cannot commend them too highly. You can also check out all of their sermon audio as well – lots of good stuff here! A ministry led by Mark Dever at Capitol Hill Baptist Church in D.C. They have interviews with a number of people dating back over a decade. They are baptistic and congregational, and sometimes don’t deal with texts as directly and in as much detail as I would like, but there is a ton of great thinking on how the church should function. The last four episodes (as of today) have been especially good. Be sure to search the interview archive to find interviews by name of the interviewee. Many of you are no doubt familiar with John MacArthur’s preaching ministry. There are a number of feeds, including the radio broadcast version and the weekly pulpit podcast. Alistair Begg – insightful, theological, practical, and easy to listen to. What else do you need? Tom Pennington just started preaching through the book of Romans a not long ago and is wonderfully helpful and clear in his expository preaching. Shane Koehler is the teaching pastor at this church in Woodstock, GA, where I have several good friends and have visited many times. He is masterful in explaining the biblical text in a concise way and going no further than what the Scripture says. Just like what it sounds. A half-hour radio broadcast that focuses on applying the Bible to current trends and thinking in the larger Christian world. Very insightful and easy to listen to. Their podcast logo is John Owen photoshopped as listening to their podcast; you can pretty much guess what you’re getting here. They come from a Reformed/Presbyterian point of view and there is not much direct exposition of Scripture, but where they already understand Scripture rightly (and usually they do) there are some really good insights into the Bible’s application toward contemporary Christian culture. A sizable dose of sarcasm and humor is thrown in for good measure. What about you? Which podcasts have you found helpful? Are there any you could recommend to me to grow in my knowledge of, and obedience to, the Bible? 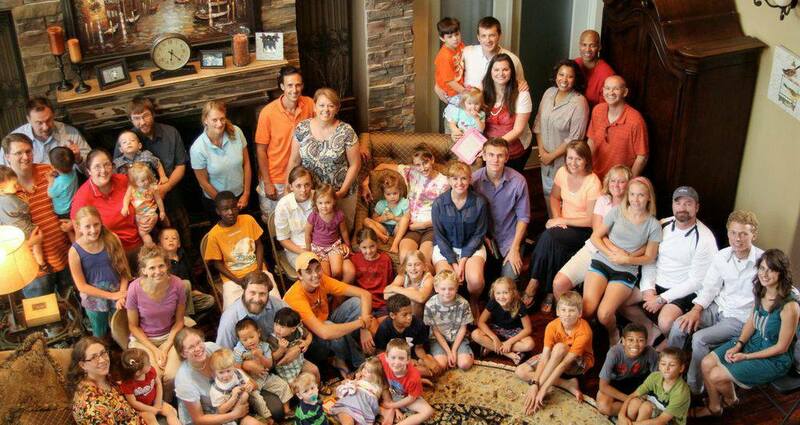 One year ago today, June 16, 2013, a group of several families met in a home in Farragut for the first meeting of our Church Planting Core Group. Sent by Grace Community Church in Maryville, the core group consisted of ten families who were eager to see biblical ministry, built upon the exposition of God’s word, taking place in a new spot some distance from our current church. We spent our core group meetings studying the doctrine of the church (“ecclesiology”) as a biblical foundation upon which to base local church practice. Along with this we enjoyed wonderful themed meals, singing together, and time in prayer for one another and for our upcoming church efforts. The core group adopted the name “Crossway Bible Church” through the most convoluted balloting system ever invented (Confession: I invented it. I won’t be allowed to do it again). We are officially recognized by the government and everything, and even have a real website (When do we get to shed the “church plant” label and just be a “church”? My vote is for “immediately”). We saw the Lord answer our prayers for a Sunday meeting spot (Pellissippi State Community College), which has been as perfect of a location as we could have asked for. After meeting for eight months as a core group on Sunday evenings in a house, we had our first Sunday worship service on February 2, 2014. After a couple of “practice church” weeks, we opened to the public on February 23. In the middle of a brutally cold and very snowy winter – by Tennessee standards, at least – we were able to open on schedule without any weather issues, a wonderful answer to prayer. Every family from this original core group has remained and has become actively engaged in serving, many wearing multiple ministry hats, as well as many serving in ways they had never served at all before. Since we opened to the public, a number of families and individuals have been visiting, including many who have become regulars. Many of these are also becoming a part of the various areas of ministry of the church. We have seen many elements of church body life taking place, including men’s and ladies’ Bible studies, Wednesday night small groups, Sunday night classes, and a budding Sunday night men’s prayer ministry. And, of course, not neglecting our GCC spiritual heritage, we have all-but-taken-over the local McDonald’s after our Sunday evening activities! These more formal things are in addition to the growing fellowship that takes place throughout the week as people serve one another and encourage one another according to their needs. We have had a joyful time learning from the Scriptures together, including studies in the books of Philippians, Colossians, Jonah, 2 Peter, Leviticus, Matthew, Numbers, and Deuteronomy, as well the subjects of the Scriptures, God, and evangelism. God’s word continues to prove itself to be a bottomless gold mine, and an all-sufficient resource for the life and ministry of the church. We are eager to see what the Lord will do in the next year and for many, many years to come, if he wills. For now, though, we can’t help but be immensely thankful for what he has done so far! Soli Deo Gloria.